Did you know that orthodontic treatment is not just for teens and adults? 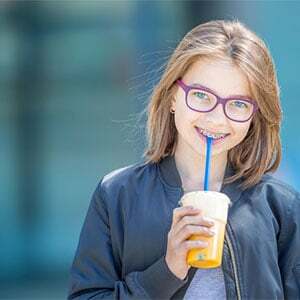 In fact, the American Association of Orthodontics (AAO) recommends that by the age of 7, children should have an initial orthodontic consultation. These comprehensive consultations determine whether or not a child’s teeth are developing properly or if early orthodontic treatment is or will be needed in the future. Are You Too Old For Braces? When you think of braces, who do you picture wearing them? If you’re like most Americans, children and teens come to mind. If you’re unhappy with your smile, you probably think you missed your chance for straight teeth, but that couldn’t be further from the truth. Thanks to advances in technology, orthodontic treatment for adults has become more common while producing excellent results. So much so, The American Association of Orthodontists (AAO) found that one in five orthodontic patients is over the age of 18. Did you know that orthodontic treatment is more than just straightening teeth? The American Association of Orthodontists (AAO) states, “The goal of orthodontic treatment is a beautiful smile and a good bite—meaning straight teeth that mesh well with the teeth in the opposite jaw and look great.” A straighter smile isn’t only good for aesthetics, it can also make it easier for you to bite, chew and even speak. It’s 11 pm and, while you should be in bed, you’re standing in front of the fridge trying to decide a snack of choice before calling it a night. You know this isn’t the best life choice for your waistline, but did you know that it’s also bad for your oral health – especially your braces. Your orthodontic treatment increases the potential to leave food behind on the teeth after eating.